What in the world happened to the Lions? It’s amazing how much you can accomplish when you don’t sink yourself. 1. Matthew Stafford mistakes? They were aplenty. He turned in his second shoddy performance in a row, throwing three interceptions and misfiring on several seemingly easy passes. 2. Penalties? Those came in droves as the Lions drew eight flags for 89 yards. 3. Letting a late lead slip away. The Lions had a one-point lead with just over two minutes remaining when they allowed Ravens quarterback Joe Flacco to march his team down the field to set up Justin Tucker’s 61-yard game-winning field goal. When you put all of these things together, is it any wonder that Detroit slipped to its fourth loss in its last five games? 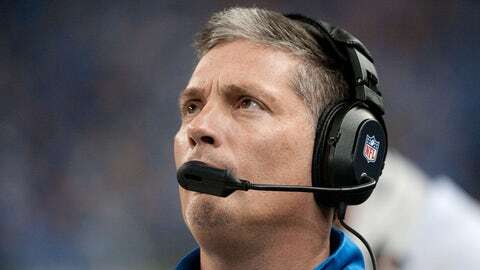 "We have two games and we’re one down in our division," said Lions head coach Jim Schwartz after the game. "This is a setback no question, because we did control our own destiny before tonight." That control is now gone. The 7-7 Lions have two easy games left on their schedule (home against the Giants and at the Vikings), but they will need to win out and get a loss from the divsion-leading 8-6 Bears to win the division and make the playoffs. In case you didn’t know, Detroit swept the season series with Chicago. Think this loss wasn’t big? There might be more than a few people pointing a finger at Calvin Johnson after this game, despite how unfair that might sound. This is Megatron we’re talking about after all. You don’t see drops from Johnson on a regular basis. But this one in particular was somewhat costly as the Lions held a 7-0 lead in the first quarter and were driving down the field. If Johnson had been able to pull down this catch on third down, he had a lot of open space in front of him and could have given the Lions solid field position just outside the red zone. At the least, the Lions could have added a field goal. However, the pass fell to the ground and the Lions were forced to punt. On the ensuing possession, the Ravens put together a 15-play drive that ended with the first of Tucker’s six field goals on the night. Johnson had another crucial drop on a third down later in the first half, which was his ninth of 2013. That’s the most drops in a season in Megatron’s career. Ouch. Remember in the middle of last week, when Ravens rookie safety Matt Elam made waves when he insinuated that Calvin Johnson was getting old? A ridiculous comment for sure, one which Megatron gruffly brushed off with a promise to show Elam some "old man strength." Speaking of the Ravens (8-6), they’re in great shape despite some uneven performances to start this season. The win pushed them into the sixth spot in the AFC playoff race and they welcome the hobbled Patriots to town next week — suddenly a very winnable game — before closing out their schedule at Cincinnati. All they have to do is win out to capture the AFC North, and if the Ravens have taught us anything over the years, this is the time of the season when they somehow pull together and win games they’re supposed to lose. This is a Baltimore team that most of the league doesn’t want to face going forward. That hold in the end zone in the second half looks like it should have drawn a flag and given the Lions a first down at the 1-yard line, however everyone’s flags stayed firmly in their pockets. If this isn’t pass interfernce, what is? It is called an "inside arm grab". It is a category of interference. The inside official has to be aware of that. Bad miss. Detroit settled for a field goal. Those extra points definitely would have come in handy. What a start to an NFL career it has been for Fauria. He has 12 catches this season — and seven touchdowns.